In 1941, before America entered World War II, determined young LeRoy Gover signed on with Britain's Royal Air Force to fly the plane of his dreams, the fast, sleek Spitfire. When America joined the fight, he transitioned to the powerful P-47 Thunderbolt. Former USAF pilot and aviation historian Philip D.
Unfortunately, due to sales rights restrictions, we cannot offer Spitfires, Thunderbolts, And Warm Beer for sale in your country. In 1941, before America entered World War II, determined young LeRoy Gover signed on with Britain’s Royal Air Force to fly the plane of his dreams, the fast, sleek Spitfire. When America joined the fight, he transitioned to the powerful P-47 Thunderbolt. Former USAF pilot and aviation historian Philip D. Caine has skillfully selected from the young flyer’s letters and diary entries to create a vivid portrait of the kind of man who helped win the war. 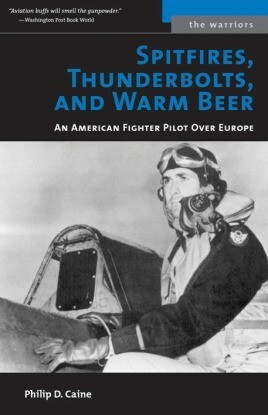 A story of great courage, Spitfires, Thunderbolts, and Warm Beer is a testament to the many other brave men who served.